Whether you’re a full-time RVer or occasional traveler, you surely want to be as comfortable as possible while on the road. And you’ll also want to protect your RV appliances and water systems. One easy way to ensure greater comfort and longer-lasting RV components is to invest in a good water softener for your RV. 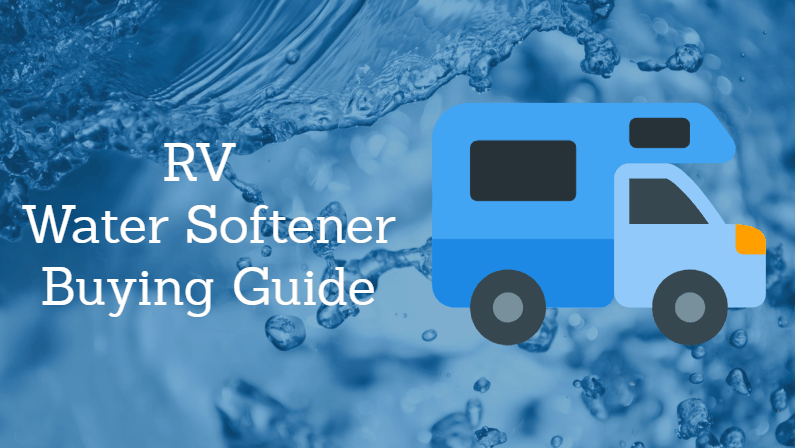 In this guide, we’ll help you pick the best RV water softener based on your needs and budget. It’s always difficult to pick a single “best” option for anything, so we put together a list of several top picks. We made our selections based on physical size, product quality, warranty/support, and other factors. See our top recommendations below! Below, find RV water softener reviews for our top recommendations. 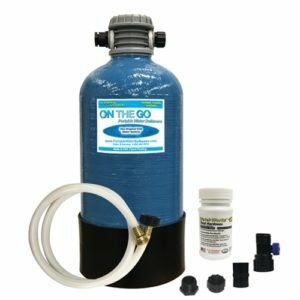 The On-The-Go is perhaps the best RV water softener on the market. It’s designed specifically for use in RVs, and comes with the necessary adapters and equipment for RV use. It’s compact yet high-capacity, making it perfect for most size RVs. And it’s fully portable, so you don’t necessarily have to install it permanently in place if you don’t have the right setup for that. In terms of specs, this unit is impressive. At 16,000 grains, it has a very high capacity. It can soften up to 1,600 gallons of water on a single cycle. And thankfully, it’s very easy to regenerate – you simply use 2 boxes of normal table salt, and the entire unit can regenerate in just 30 minutes. The unit is easy to use, the perfect size for most RVs, and has great ratings in RV softener reviews. It’s a great portable water softener for RV use. Overall, it’s our top recommendation. The H2O Mobile Soft Water unit is a great option for RVers. It’s similar to our top pick, but is priced a bit lower, making it a good budget-friendly option. The unit offers a 16,000 grain capacity, which easily regenerates with table salt. It’s cheap and easy to regenerate, and doesn’t require any special equipment. This product has received excellent reviews from fellow RVers. Many mentioned that the company who makes this product really stands behind it by providing excellent customer service. This is an important factor to consider, particularly for folks who are new to water softeners. 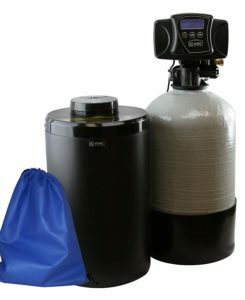 For folks looking for a premium product, this unit from ABC Waters is the best water softener for RVers. It features the popular Fleck 5600sxt valve, which monitors the health of the system and automatically regenerates when needed. This eliminates the need for messy manual regeneration! This unit also comes completely ready-to-go. The company preloads the resin tank, pre-programs the digital valve, and provides all the installation gear you’ll need for an easy setup. The company also stands behind their products, offering a 10-year warranty on the mineral tank and 1-year on the brine tank. Plus, they are always there if you need a helping hand. Customer service reps are available by phone, text, email, and even facetime chat! If you don’t mind spending a bit more, this is the best RV water softener. Inconsistent Water Sources – As an RV traveler, you’re constantly exposed to new water sources. If you take a look at the USGS water quality map, you’ll find that many areas have extremely hard water, while most areas in the US have at least moderately hard water. By getting a good RV water filter and a water softener, you can ensure you always have access to high quality water, wherever you go! Appliance Damage – Hard water can wreak havoc on your RV’s plumbing system and appliances. Since RV repairs can be expensive and cumbersome, it’s often a great investment to reduce the risk of damage in the first place by getting a water softener. Skin & Hair Health – Hard water can negatively affect the health of your skin and hair, causing dryness and brittleness. A water softener can help significantly, and also reduces the amount of soaps and shampoos you need to use. Filter Lifespan – If you also use a water filter in your RV, you’ll likely find that using a water softener as well can help to extend the lifespan of your filter. In fact, water softeners can help extend the lifespan of many RV components and accessories! Mineral Stains – Have you ever noticed mineral buildup or stains on your shower, faucet or toilet? If so, chances are hard water is to blame. Using a water softener can help prevent this unsightly buildup in the first place! Size – Anyone who has traveled in an RV could tell you that space is almost always at a premium. You simply don’t have the amount of free space that you’d have in a traditional home, so you need to carefully consider your purchases. We focused on compact, RV-friendly models for our recommendations. Capacity – Since you’ll likely be using the water softener for the entire RV (sinks, showers, etc) you’ll still need a decent capacity on your softener. We focused on models with at least 16,000 grains, which is a good capacity yet still able to fit in a relatively small space. Quality – Of course, the quality of the product was an important consideration! We looked at manufacturer specs, third-party reviews and our own data to determine the quality, effectiveness and durability of each product we considered. Warranty & Support – Even with good quality products, issues can crop up. We focused on models with good warranty coverage, and a well-rated customer support team to clear up any potential issues.